Can Too Much Fruit Make Your Stomach Cramp? What Causes Stomachaches from Dried Fruit? Bloating is caused by many reasons, including your choice of foods. Eating too many carbs or choosing ones that your body can’t properly digest can result in bloating, gas, and other intestinal and stomach discomfort. In most cases, bloating is no reason for concern. If you experience other bothersome symptoms along with bloating, talk to your doctor to find out if there’s an underlying medical problem you need to address. Carbs retain water, so you might end up bloated if you eat too many of them. This is especially true if you’re dehydrated. When you don’t drink enough water, your body will hold on to every single drop you do drink. Focus on drinking at least eight glasses of water a day, and see if that solves the problem. 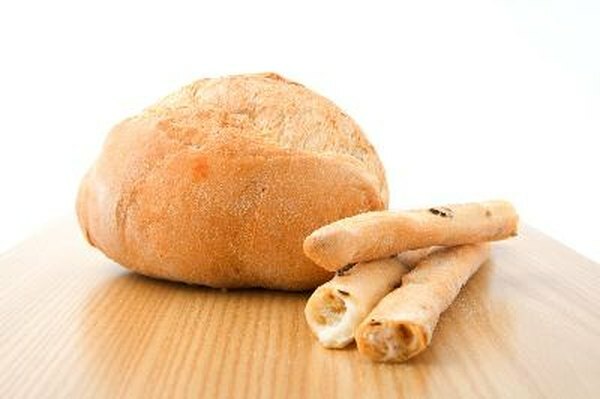 Gluten is a protein found in a number of carb products. Wheat is the major culprit, but gluten is also present in barley, oats and rye. According to nutritionist Kate Cook, people who have a sensitivity to gluten will experience bloating, as well as constipation, fatigue and other side effects after consuming it. Gluten intolerance is more serious and can lead to severe allergic reactions, mouth ulcers and bone problems. If you experience bloating along with other symptoms after eating carbs that contain gluten, talk to your doctor to rule out a serious problem. Non-absorbable carbs are those that your body cannot digest, such as artificial sugars, including sorbitol and sugar alcohols, which are commonly used in diet foods and drinks, candy and gum. Lactose and fructose are also non-absorbable sugars. Some people have no obvious reaction to consuming these carbs, while others might experience bloating, diarrhea, flatulence and stomach irritation. Carbs high in fiber can cause bloating, especially if you’re not used to eating them on a regular basis. Ironically, the key to dealing with bloating is to eat more fiber-rich foods, but to do it in small amounts and on a regular basis. This will help your digestive system work more smoothly and will prevent constipation, which also leads to bloating. Bran cereal, vegetables, dried fruits and whole grains are all good sources of fiber. What Are the Benefits of All-Natural Eating Habits?